Under the unforgiving glare of a Mediterranean sun, The Outsider moves with contradictory force in this ground-breaking production. 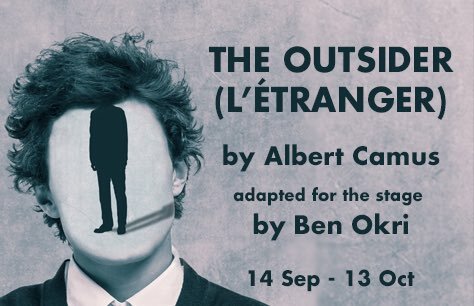 The first major UK production of Camus’ masterpiece The Outsider, specially adapted by Booker Prize-winning poet and novelist Ben Okri. Meursault is a man who will only speak his truth. In an age where we are being increasingly told what to feel, the story of Meursault is a blast of uncompromising honesty. It is the story of a sun-astonished man prosecuted for killing an Arab, but convicted for not crying at his mother’s funeral. The hypocrisy of society has never been so clearly exposed. Searingly relevant to our increasingly disquieting times, this is unmissable theatre. Albert Camus – novelist, essayist, philosopher, Nobel laureate – and his creation Meursault are twin icons of 20th-century literature. Ben Okri, author of The Famished Road, is one of contemporary literature’s most important, and influential, writers. This intriguing new Coronet production brings them together for a rare dramatisation of one of modern literature’s most controversial works.